Weddings are all the rage this season. From themed parties to bollywood celebrities to cocktails and bars, each and every wedding is unique on its own. You must be getting invited to lots of weddings. Then you must have heard about Weddi-quette. No? Well these are wedding etiquettes everybody should follow, be you a guest or bride or groom. These rules will help everyone to make a wedding successful without ending up in a disaster or a total fiasco. The wedding is most important day in a brides and grooms life. Let’s make it even more special. 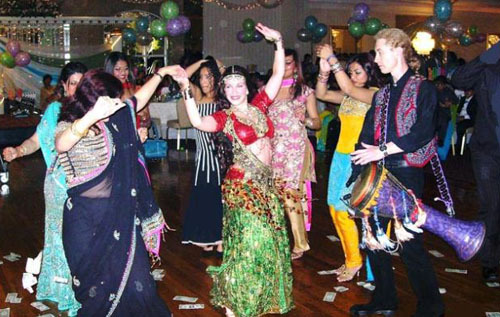 Following are some Dos and Don’ts to follow at a wedding party so that you are an ideal guest. Follow them all to make it a success. 1. RSVP as soon as humanly possible: within a couple of weeks of receiving invitation at the latest. These are good manners and give the host an idea about how many guests are gathering to make appropriate arrangements. It also helps in determining the wedding cost. Check the invitation carefully to know how many people are invited. If it says two, then take only two. Otherwise it will create difficulty for the host. 2. If you are invited for the main ceremony then do not show up just on reception. Also be on time and not disturb the proceedings by being late. 3. A wedding gives you golden opportunity to dress up yourself to your heart’s content. Style as the occasion demands. You would not want to look an odd duck. If the theme is western then go for formal gown, if Punjabi then salwaar kameez and so on. If you’re unsure of the dress code, ask someone familiar with the wedding. 4. Even if you are not attending, you should give wedding gift to the newlyweds. After all they took the pains to invite you. Thank them for invitation. The wedding gift should be something which costs somewhere near the cost per head being born by the host. Etiquette dictates that if you were invited, you owe the newlyweds a gift. You may even loose long term friendship over this. 5. Sit at the assigned table: If there is some kind of seating arrangement made by the hosts, then don’t mess it up. They went to a lot of trouble to know the relations and set up the arrangement. Don’t mess it up and cause discomfort to the host. As it is, the host has enough pressure to handle, don’t add to it. 6. Congratulate the family: Even if you know the couples and have congratulated them already, do seek out their families and wish them joy and happiness. It’s what etiquette demands. Also you will be able to form new relations. 1. If you weren’t invited with a guest, don’t show up with one. Don’t bring uninvited guest. They might ruin the party. And don’t ask the bride or groom if you can bring one. Because this will be an awkward situation and they will not be able to say no to you. Be thoughtful and add to the party environment by keeping out disturbing elements. 2. Yes, the “no bringing uninvited guests” rule includes your kids. The main centres of attraction are the bride and groom not your kid. They will only disturb you and move your attention away from the couple. You may not be able to enjoy the party to its fullest and then your mood will certainly be off. So keep your kids with baby sitters and enjoy the party with your friends and family. 3. Don’t dress to compete: You would not want to take away the attention from the bride and groom, would you? It’s not a fashion show or your school prom, it’s a wedding. Dress appropriately but don’t overdo. The bride and groom have every right to look their best among all the party attendees. 4. Don’t be disrespectful of the couple’s religious or cultural traditions. If you are attending party of someone who follow different tradition and religion than that of you don’t be disrespectful to their culture. Follow along with the rituals and even participate in them. It’s expected from you. 5. No to cell phone: You are here to attend a wedding, not in a hat room. The wedding offers you chance to socialize and renew your relations. Don’t waste this chance by concentrating only on virtual life of cell phone and not on real people around you. And random calls will disturb the rituals going on. There is life beyond your cell phone, enjoy it. 6. Don’t get wasted: If there is bar setup at the wedding does not mean you are at a pub where you are getting free drinks thereby giving you opportunity to indulge to your heart’s content. A Big No to getting drunk. This will not only embarrass the guest present but you could be making a spectacle of yourself. Your friends may not like you afterwards. Take a drink or two and retain your senses. Get to know what should be best possible ideal Indian wedding menu, so that every guest remembers your hosting for years to come. Food has a very important role to play in wedding parties, because where unexpectedly things go wrong, a heartfelt meal can save the day. 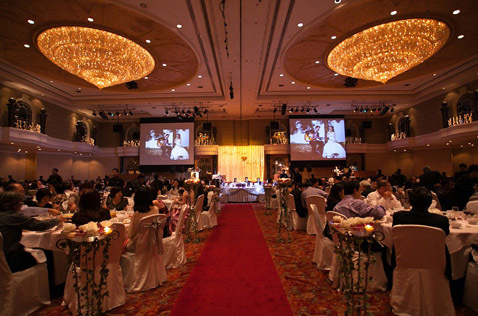 Thus, the wedding party menu should be memorable and contemporary. Read on for the best menu to offer your guests on your wedding in India. Well, one of the most popular buffet items on your wedding party menu should definitely be chocolate fondue fountain. The sweet aroma of rich, melted chocolate fills the air, as your guests are tempted to dip an unlimited assortment of treats into a waterfall of decadence. Starters should be tempting. Consider the Asian Snack Tray which will include Vegetarian California Rolls, Vietnamese Spring Rolls, and Sesame-crusted Chicken Makki, red chili dipping sauce and nuac cham sauce, wasabi and ginger as they have been maintaining their prominence as the most relished starters in a wedding party. A bountiful presentation of crisp-cooked “best of the season” vegetables will also be wonderful. The selection may include snow Peas, green Beans, carrots, cauliflower, red and green sweet, peppers, cherry tomatoes, zucchini, hummus, caramelized onion dip and spinach-artichoke dip. In the main course, for your vegetarian guests serve Moroccan Vegetable Tagine over couscous, Bulgur Stuffed Cabbage Rolls with z’hug tomato sauce, Sautéed Pieriogis with favorite filling and Penne with porcini-puttanesca sauce. These are the most favorite flavors of present day wedding parties. For the non-veggies guests try serving Boneless Capon Breast stuffed with savory matzo, Poussin stuffed with bulgur, raisins, pinenuts and fresh mint chutney, Fig-Glazed Boneless Breast of Chicken, Roast Chicken with artichoke hearts, wild mushroom and sautéed leeks, Handmade Chicken Fingers with honey-dipping sauce and in the Seafood Entrees you may include Falafel-Crusted Halibut in Jerusalem dressing, Pan-Seared Cod with chermoula sauce, Cod Fish Stew with tomatoes, leeks and peppers to make it the most delicious experience. Accompaniments may be Carrot and Sweet Potato Tzimmes, Israeli Couscous with golden raisins, pine nuts and scallions, Kasha Varnishkes, Jeweled Persian Rice with cranberries and orange zest, One World Rice Pilaf with toasted pinenuts, Wild Mushrooms and Vegetable Confetti for the perfect main course menu. Your party will be incomplete without the rich variety of deserts. Treat your wedding guests with the most popular tastes of the day as Lemon Semifreddo with Hazelnut Tuile and tangy rhubarb puree, Mixed Summer Berry Napoleaon citrus-sugared pastry, cardamom-lime cream and vanilla-scented caramel, Rum-Soaked Carrot Cake with candied hazelnuts, Miniature Caramelized Carrot Cheesecake, Cinnamon-Apple Coffeecake, Chocolate-Dipped Macaroons, Sufganiyot, Mandelbrot and Chocolate Nut Clusters. You can also serve a variety of herbal teas or a variety of Columbian & Decaffeinated coffees available to make your wedding party unique and memorable. The perfect catering service will set the mood of the entire wedding. Therefore always consider the best caterers in the business. Act as imaginative as possible and organize the wedding menu theme wise like contemporary, native and tasty within your budget.